At the Top of Squirrel Spur: Winter Mitt Madness...and some spinning! Winter Mitt Madness...and some spinning! Well, actually they are merino/angora in a millspun I had done by Still River Mill some time back. The merino came from Thistle Cove Farm and the yarn is sweet to work with. I hand painted this in a colorway I called Rhododendron. This is the last little bit of it in this color. I still have some in greens and blues. 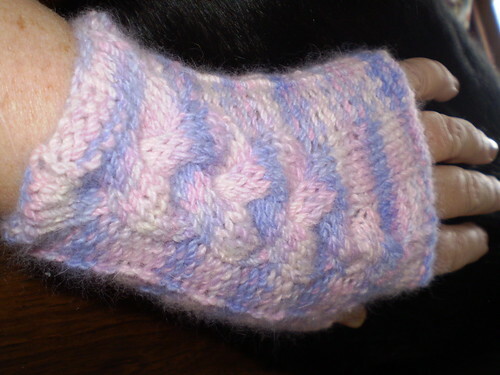 The pattern is called Eve's Mitts by Gina House, an indie designer. There was a corrected mistake in the last cable cross that I didn't catch but I really don't mind the result. The designer has a book of her patterns available and is also doing a podcast that I need to check out! I also finally finished a pair of "man mitts" in a sturdy gray wool yarn for the SO...his late but much need Christmas present! It has been cold enough to need angora mitts here in Meadows of Dan. Bitter, bitter winds, with temperatures plummeting at night to 4 degrees, and highs in the mid 20s on the days we're lucky. Not fun unless you're properly prepared! I wear lots of layers and really like my bigger angora mitts in bright yellow over a pair of gloves. It's taking three trips a day, at least, to the bunny house to make sure that they have enough water to keep them eating. As I'm writing a few snow flakes are starting to fall. Again. Tonight is supposed to be knitting group night at Two By Two BBQ...we'll see how that works out if the weather gets bad. Most folks are from the mountain, but the couple of people from further away have already canceled. Safety first! Surrounded by white snow and gray skies, I've been longing for color and my current projects are amply fulfilling that need. This is the Larkspur Wrap Sweater by Ellen Gormley, which appeared in the Interweave Crochet Fall 2009 issue. I've been very happy with how this stitch pattern shows off this lovely yarn, which is hand painted superwash merino by Woolybuns. I kept saying this was an angora blend until I read the tag...it's SO soft and lovely to work with. The colors are a bit more subtle than they look in the picture here on my screen. 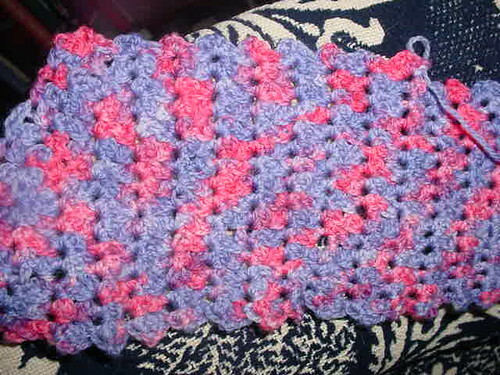 Lovely deep pink and a soft lilac blue. Ellen also has a book coming out on crochet soon. And of course, since it's now officially winter, I'm spinning! I have several projects lined up, as I think I mentioned before, and now I've added a special order in natural colored black angora to the list. But I couldn't wait to get this lovely fluff onto my wheel, ahead of all the fleeces that are demanding to the spun and the angora that is begging to be blended. 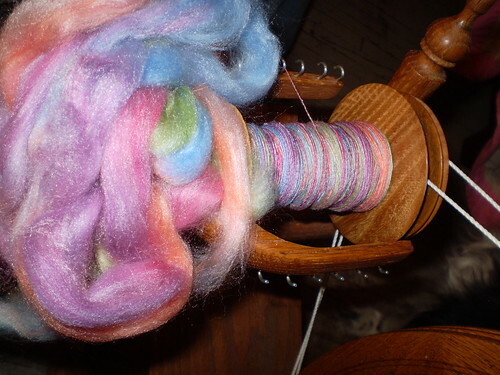 "Jelly Beans" is a beautiful roving from Fiber Monster that I purchased last month. Just couldn't resist this shiny when I saw her tweet on twitter about some of her fiber. And I even had a project in mind when I ordered it, the Feather and Fan Cowl that appears in the latest issue of Spin-Off. Hope everyone is keeping warm and cozy, surrounded by wool and other fiber! If you need something to listen to while you're knitting, spinning or otherwise fulfulling your fibery goodness, check out the Knitting in the Round podcast. We're on lucky episode 13! I'll be working on the show notes as soon as Natalie and I can reconnect.